A couple of local Kansas businessmen, intrigued by the value-added potential of ethanol from their grain, began the process of founding Western Plains Energy in Gove County, Kansas. 1100s: Ethanol was isolated from wine. 1826-1850s: In the 19th century, people fueled their lamps with whale oil, vegetable oil, and other animal oils. In 1837, camphene, which was made with a mixture of turpentine and alcohol, became a popular lamp-lighting source because it was at least 50 cents cheaper than other methods. If not properly handled, camphene could combust. Samuel Morey, an American inventor, noticed that turpentine vapors were similarly volatile, and he was inspired to create his internal combustion engine prototype—a prototype that paved the way for future inventors. 1876: Nikolaus Otto, a German inventor, developed the first internal combustion engine to burn fuel in a piston chamber. Nikolaus also created the Otto Cycle, which was a stationary engine powered with four easy movements. Remnants of Otto’s design can be seen in our car engines today. 1896: In his tiny Detroit workshop, Henry Ford created the Ford Quadricycle, which was powered by ethanol alone. The quadricycle reached 20 miles per hour, and due to its success, Ford went on to found the Ford Motor Company in 1903. 1919-1933: Prohibition prohibited the sale, production, importation, and transportation of alcohol in the United States. Ethanol-powered cars were no longer realistic, and unless it was mixed with gasoline, ethanol could no longer be used to power cars. Oil crisis and ethanol’s resurgence. 1970s: An oil embargo was put in place in 1973, causing the price of oil to quadruple. Despite its previous disappearance, ethanol once again became the fuel of choice. 1974: The oil embargo ended and The Solar Energy Research, Development, and Demonstration Act of 1974 was enacted, ensuring that the government pursue viable fuel options in the United States. 1979: A second oil crisis occurred in the United States, driving up the price of crude oil. President Carter’s administration prompted ethanol production by offering tax incentives. 1992: The Energy Policy Act was enacted to reduce dependence on foreign fuel and to ensure that alternative-fuel vehicles were created. 2003: With ICM of Colwich, Kansas, we began constructing the Western Plains Energy plant. Our original plant was designed to produce 30 million gallons of ethanol. 2004: We completed construction and began operations. 2005: We expanded operations to 40 million gallons of ethanol. During this time, the U.S. became the world’s largest producer of ethanol fuel. 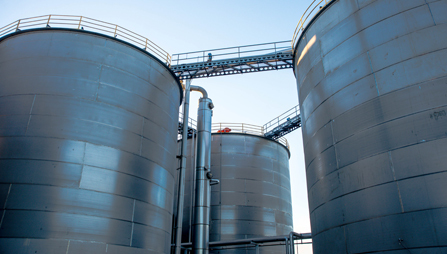 2011: Today, WPE produces 50 million gallons of ethanol annually. We believe that ethanol is the best choice to fuel Kansas because it burns cleaner than gasoline, it has a lower level of harmful emissions, and by using ethanol, we support local farmers. 2018: We continue to make strides in Kansas. Of our original nine board members, six are still in place. We have several farmers, a banker, and a local Kansas businessman on board, and we work together to make sure that we provide the best ethanol products in Kansas. Today, ethanol is lowering the price of gasoline at the pump. It is not uncommon to find gas stations in Kansas that offer both E10 and E0 (0% ethanol; 100% gasoline), and the E10 product is selling for $0.20-$0.25 per gallon less than E0. No fancy math is needed. It is right there on the pump for the consumers to decide for themselves. Without Kansas farmers, ethanol would not be an option and we would all be paying more at the pump!